Children in Staple Hill have helped to launch a campaign to raise awareness about free childcare which is available for some two-year-olds. The Government funded scheme was introduced to improve the outcomes of children from disadvantaged backgrounds by providing free childcare for this age group. 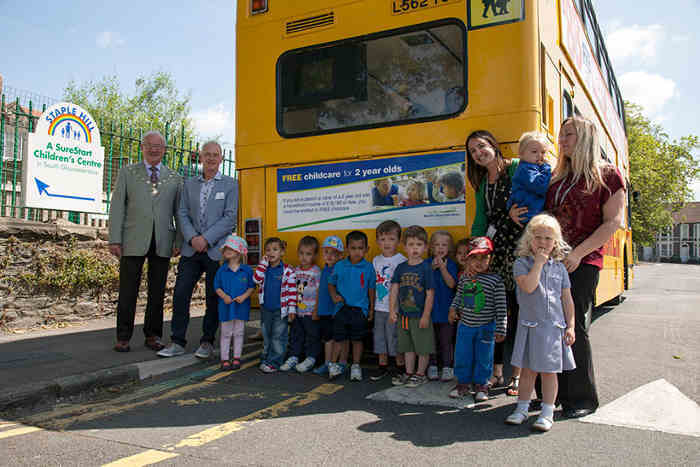 To help raise awareness about the second round of funding, Chairman of South Gloucestershire Council Howard Gawler (pictured left) joined Cllr Ian Blair, Chair of the Children and Young People’s Committee and a number of children at Staple Hill Children’s Centre where many families are already benefitting from the free offer. Cllr Ian Blair, Chair of the Children and Young People Committee, said: “We have already been very successful in getting families on low incomes to take up this scheme since it was introduced. We want to ensure more parents and carers are aware of this initiative which entitles eligible families to claim up to 15 hours free childcare a week which includes access to learning and fun activities. The free childcare would be made available in a nursery or pre-school setting or with a childminder. These mums have already taken up the offer at Staple Hill Stars Pre-School. Further information is available on our website at www.southglos.gov.uk/childcare or alternatively you can find out more by calling 01454 868008. You will need your National Insurance number to hand.